Griping parents have been around since well, as long as children have been around. It’s not that they’re bad parents or don’t like their kids, parenting is a hard job and sometimes they need to vent! Now, with the invention of Twitter, parents can share and complain about their parenting struggles to the whole world, while also finding comfort in the fact that they are not alone. 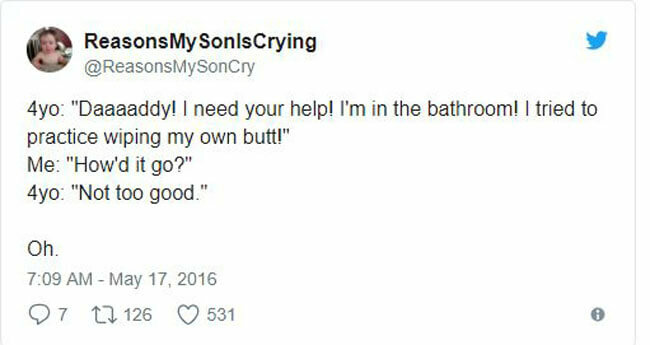 Here are some of the funniest Tweets parents have sent out to their beloved children. When it comes to little kids, we all know that birthdays are an exceptionally big deal. It’s one of the only days of the year when they basically get whatever they want without the fear of getting reprimanded. They’ll wake you up before the sun is up to let you know that their big day is well underway. This is some simple and very true advice coming from Beau Coffron. It’s so true because it doesn’t matter who you are, at one point you were begging your own parents to watch you do something underwhelming. Whether it was missing a basketball shot on your Little Tykes basketball hoop or sliding on the floor wearing socks. As with most things in life, you learn how to do things by doing it yourself. When you’re a little kid, there are a lot of very simple things that you have to learn that take practice. Zipping up a jacket is one of them and some adults still can’t do that either. Wait until they learn to tie their shoes. Apparently, with children, any laws that you thought once existed like gravity or averages go out the window. Children can literally climb on the ceiling, and they can practice a dance routine an infinite amount of times and never get it right. But hey, at a certain point it’s just impressive. Something tells me that Meredith probably wasn’t the only mother using this descriptive word for their child. Preschool, in general, is an interesting concept. It’s basically just glorified babysitting for the parents that actually would rather work than stay home with their kid anymore. The Whole Rest Of Your Life? Mommy Owl sure doesn’t seem like she’s the happiest owl right about now. This is just a grim Tweet. The rest of your life is a very long time and I hope that by the time Mommy Owl’s kids are in college that she isn’t still feeling this way. Hang in there. There’s some serious truth behind this Tweet. When they’re stuck on the ground they’re still somewhat manageable, but eventually, you have to start hiding the knives, the cookies, and eventually your alcohol. The whole ability to reach things is pretty much a never-ending problem. I don’t know about you, but that doesn’t sound like the worst thing in the world. It shows that your kid has empathy and wants their friends to enjoy the story as well. However, although they aren’t real friends, hopefully, these good intentions will carry over into the real world. This is another one of those situations when your kid is just going to have to figure it out for themselves. Sure you can help them along the way, but in the end, it’s a process of trial and error that leads to enlightenment. This is probably just one of the biggest learning curves. This will forever be one of the hardest realizations as a parent. That moment when you realize that your kid knows how to lie and that they’re good at it. The game just changed folks, you’re facing a completely different entity now. I wish you the best of luck, Mr. Knop. The only thing scarier than that is owning a white couch. It seems like more people would rather come face to face with Michael Meyers than stumbling upon this impending catastrophe. I thought it was in the parenting handbook to stop buying Sharpies once you have a kid? Where Did Your Pants Go? I relate to this Tweet on so many different levels. When it comes to the whole pants situation, toddlers really just have it more figured out than adults. Pants are overrated and that’s a universal fact. They are just trying to fight against these bogus societal norms for as long as possible and I commend them for it. I guess I just feel sorry for you that it took you this long to find this out. Of course, you have to tell your kids that you had a productive day doing “housework” and all that jazz. But in reality, you could have had a nice beach day and they would have never known. We all know that one of the worst things in the world is stepping on a LEGO, but your child planting them so that you injure yourself? That’s just straight up sadistic. Or is it genius? Or both? You’ve got one heck of a kid on your hands, Jessica. Clearly, this is not Unfiltered mama’s first rodeo. This strategy only comes from extremely veteran parents that truly know the ins and outs of parenting. I’m going to put this pro tip in my back pocket for a time when I’m sure I’ll need it. There’s no shame in dying first. Hold your horses there! I get that parenting can be tough and that you need sleep to survive but this is your child your talking about. You want them to disappear? That seems a little bit more than strange to me. Letting your kids force you to start looking for answers at the bottom of the bottle seems a bit backward, but you got to do what you got to do. Also, sounds like you have some pretty good kids if they’re arguing about homework. That doesn’t seem normal. It seems like some parents miss the point of school. It’s not just a babysitting program. So when it ends, you should probably have already figured out things that will keep them busy. Summer camp, leaving them unattended, forcing them to get a job at the age of 5, these are all options. Steve you dog, you. Your kids are probably going crazy trying to figure out which one is the favorite and it’s surely tearing your family apart. But look at that profile picture, you probably just like to watch the world burn. It had to happen eventually, the dreaded day when your child realizes that they have no time for naps in their life anymore. Of course, they end up taking them on their own because they actually need them, but this is their first act of independence and it’s liberating.